"Quality filly with excellent movement. Great scope. Will be a beautiful filly as she matures." A half-sister to the talented Chris Waller trained eight-time winner and Group 3-placed Zumbelina, who won four consecutive races as a 3-year-old. 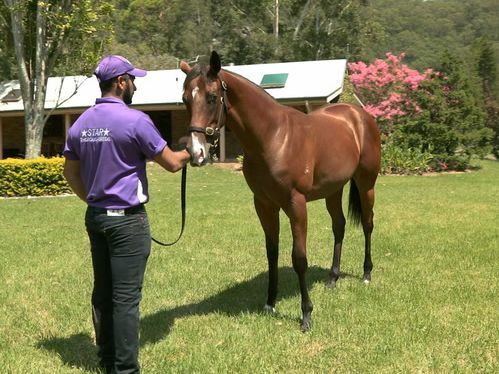 This is a filly who looks to be built for speed, with each of her first four dams winning at sprint distances and her sire Nicconi also the sire of top sprinter Nature Strip. By Nicconi, a dual Group 1 winning sprinter who is fast gaining a reputation as a top sire of sprinters. Although he only has 350 runners to date, he’s already sired 17 Stakes winners including the star sprinter Nature Strip. Sircconi, Faatinah and Tony Nicconi have also announced their class with eye catching Group wins. From Ruth’s Secret, who has left one foal to race to date, Zumbelina (pictured right) trained by Chris Waller, an eight-time winner - four of these in a row - and of $500,000 in prize money. This filly is from the famous ‘Leica’ family, which traces back to Leica Show who was a Champion 3YO filly, and grand dam of dual-Doncaster winner Pharaoh. Amarina is an excellent property to raise young horses having produced and sold stars such as 10-time stakes winner Catkins. Other recent stakes winning graduates include Group winners Property, She’s So High, Prize Catch and Aeronautical. We’re proud to present an interactive view of this outstanding filly. Get to know her from every angle by viewing her conformation on rotation, and see her action as she walks side-on to the camera. This filly is now fully sold. A strong, powerful individual, this colt is built in the mould of Capitalist.